Are you looking for your dream liveaboard? If you would like more details or to make a reservation, click on one of the Dive the World banners located at the bottom of this post or in the right sidebar. 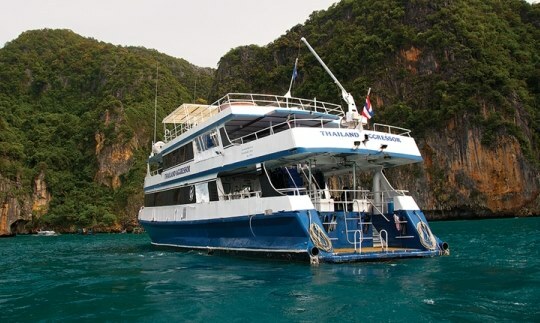 Then for this safari, go to Liveaboards / Thailand / Similans. This is the second in a series which will introduce and describe the various dive services and sites for worldwide liveaboard dive safaris. 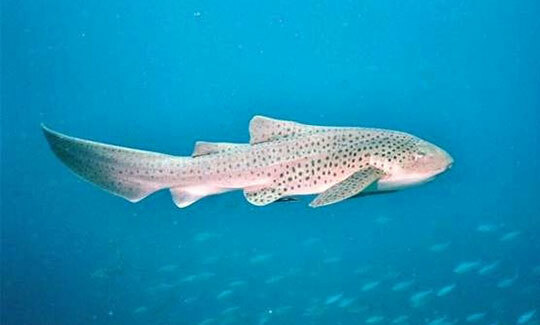 This one will focus on the trips that include the Similans, an extremely popular and exciting area to dive in Thailand. 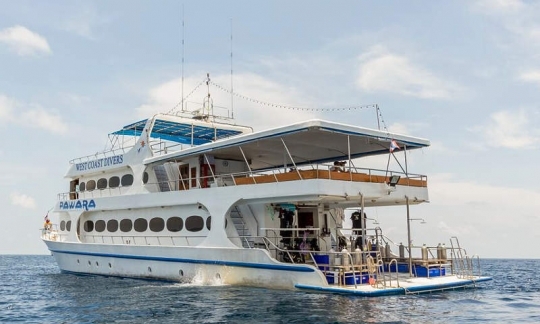 Thailand and the Similan Islands are richly serviced by 19 different boats that we represent for liveaboard scuba diving vacations of 2 to 12 days at rates of $121 to $386 daily. Below is a list of the vessels we use. After that are a recommended example of 5 great boats. 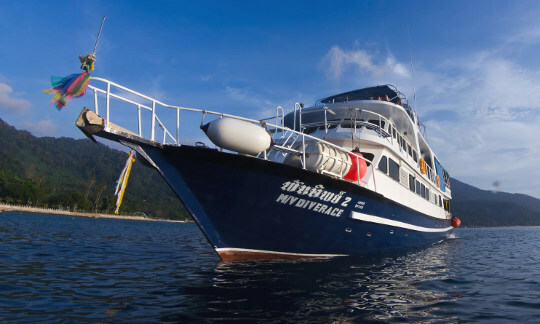 To get full information on these boats and their services, use the liveaboard search at the top of the page using Thailand/Similan Islands as the destination. Check at Dive the World by clicking the banner at the bottom of the page. Similan Islands – 9 granite tropical islands in the midst of brilliantly clear blue water, the Similans feature beautiful rich soft and hard coral reefs abundant with exceptionally fascinating marine life and the largest number of reef fish in Thai waters. There are swim through rock formations in the midst of boulders, canyons and pinnacles with numerous gorgonians, barrel sponges and exciting critters like nudibranchs, moray eels, cuttlefish and octopus. Exciting larger attractions often include reef sharks, leopard sharks, manta rays and green turtles, and when conditions are right, a whale shark. Current can make for some exciting drift diving. Richelieu Rock – Just pushing through the surface at low tide, the pinnacles of Richelieu Rock create a top Thai dive site attracting schools of snapper, sweetlips, barracuda and jacks. Like the sites in the Similans, there is a similar rich coral reef which includes some intriguing animals like sea anemones with their clownfish, and frogfish, harlequin shrimp, nudibranchs, pipefish, seahorses and ghost pipefish. Manta and eagle rays and whale sharks also pass through this area. 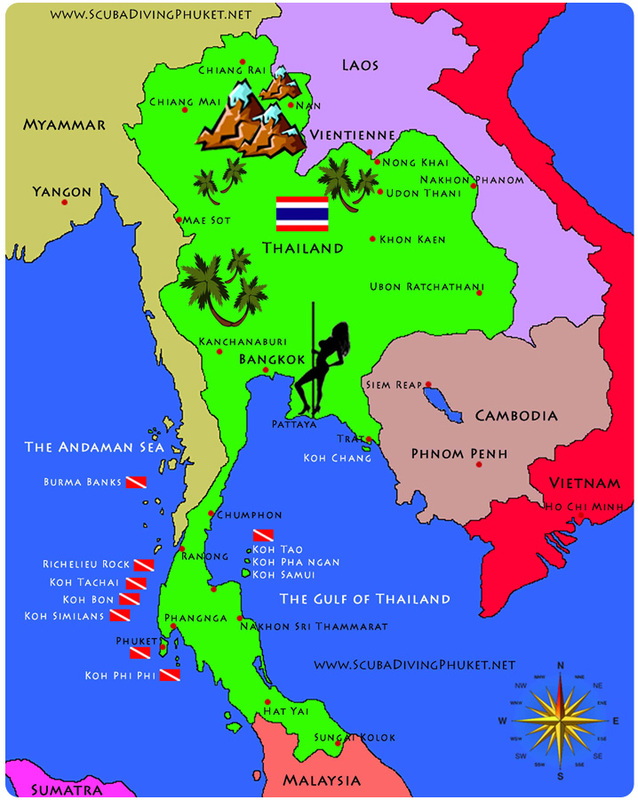 Khao Lak is the mainland Thailand area just to the east of the Similans. The Bunsoong Wreck is an attraction here. 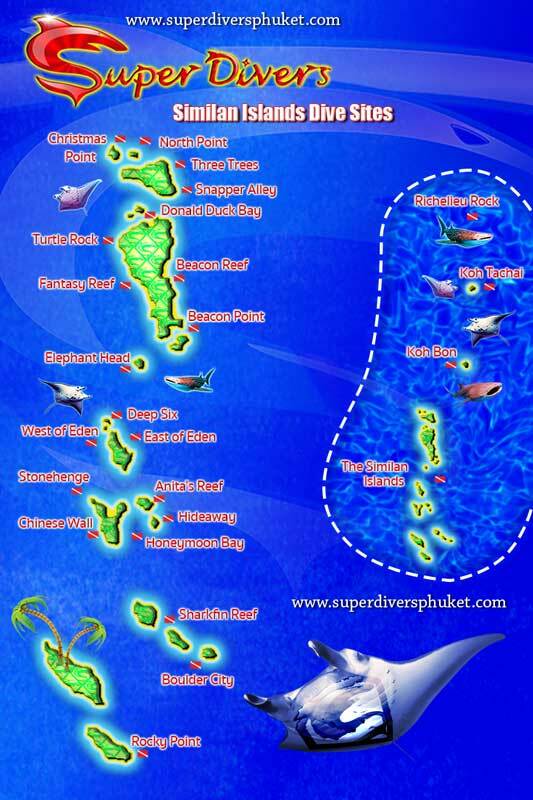 Koh Bon is a pinnacle island 800 meters northeast of the Similans and is well known as a cleaning station for mantas. Several varieties of sharks cruise the area or hang out under rocks and coral ledges include blacktips, whitetips, leopard, nurse and grey reef sharks. Koh Tachai, a pinnacle island north of Koh Bon, frequently has strong currents and abounds in prey fish that attract massive schools of predators like tuna, jacks and barracuda, and reef sharks. The reef is covered predominantly with hard corals. Burma South – This, too, is a rich coral reef area with various reef sharks, manta rays and green turtles, and the possibility of whale sharks. It is also rich with the smaller critters like nudibranchs, moray eels, octopus and cuttlefish. Learning to dive is one of those things that are on my bucket list. Anytime I can see fish and sea animals under the water makes me feel like I am on another world. Is there such a thing as being a beginner diver and being able to dive in the ocean. Im not looking to be a life long diver but looking to full fill something in my life. Thanks a lot for your comments and question. There are a couple of things you could do to fulfill your dream of diving in the ocean without having to become an avid regular diver. You could spend about 4 days to become a certified open water diver. With that you have a sort of license which will allow you to purchase diving services anywhere in the future. If you do not want to do that much, there is what is known as discover scuba diving, where you do some training with an instructor in a pool or shallow water and then go for a dive no deeper than 12 meters (40 feet) under very close supervision in the ocean. This will give you the experience, but doesn’t have enough training to give you the license. Almost all dive shops will offer both options. If you would like me to recommend where you can get it done or any other advice, let me know. Are you located near the ocean? What is a place where you would like to give it a try? Wow, I really don’t know anything about liveaboards. This is totally something new to me. We have other rent a boat-for-a-day here but not liveaboards. What an interesting business. Maybe I’ll start one here, but I prefer to send my clients to a nice bedroom every night where they can talk with the locals on an island. Anyway, I just got the idea while reading this article. Thanks for your comments. Are you in the scuba diving business? Where are you located? If you have any questions or things I might advise you about regarding setting up a liveaboard business, please let me know. I don’t have a scuba business but we have a house on an island where we tour tourist on a boat or using a van. The boat being used is only a small one but with liveaboards, we will be needing a big one where our guests can live comfortably. I just found it a good idea and another business to explore but I need the boat first. I’ll ask for your advice when that time comes. Thanks. 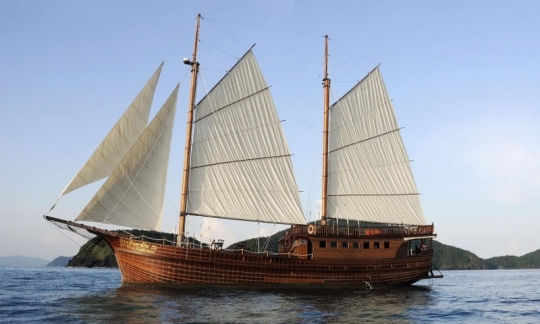 The investment in a liveaboard vessel can be expensive, but if you are someplace like the Philippines or somewhere in southeast Asia or many other places I’m sure, locally made boats can be a lot more reasonably priced and give the liveaboard experience a real cultural flavor that can be very attractive to the guests.